Named for the "greatest driving road in the world," the 2018 Alfa Romeo Stelvio is a truly well-crafted and thoughtfully designed luxury-SUV. This brand-new model from the legendary Italian automobile manufacturer sets out to conquer the sport-utility world with a sleek and sculpted exterior and luxury-grade interior accents. The trademark inverted triangle grille proudly announces its Italian heritage and the 2018 Alfa Romeo Stelvio certainly builds off the 100+ years of sports-car engineering the famed brand provides. Arriving in the late summer of 2017, the all-new 2018 Alfa Romeo Stelvio is an exceptional example of luxurious, design-based performance and Italian craftsmanship. Read on below to learn more about the well-appointed and stylish 2018 Alfa Romeo Stelvio! Under the hood of the 2018 Alfa Romeo Stelvio is a direct-injection, intercooled 2.0-liter four-cylinder turbocharged engine, designed to provide peak performance every time you press the pedal. Easily capable of providing 306 pound-feet of torque and 280 horsepower, the turbocharged engine is paired with an eight-speed transmission and features the availability for steering-column-mounted aluminum paddle shifters. The eight-speed transmission offers smooth gear shifts in less than 100 milliseconds, making the 2018 Alfa Romeo Stelvio a sleek-driving performance machine. Alfa Romeo is estimating the 2018 Alfa Romeo Stelvio will go from 0 - 60 mph in only 5.4 seconds, an industry best. The nearly perfect 50/50 weight distribution of the thoughtfully- and carefully-designed 2018 Alfa Romeo Stelvio allows it to provide you with class-leading power and the best in performance! Slide behind the wheel of the 2018 Alfa Romeo Stelvio and take back the road in style! 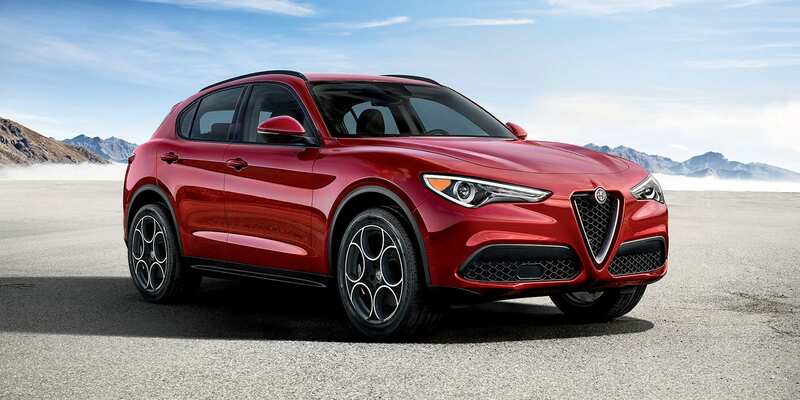 The 2018 Alfa Romeo Stelvio is a well-equipped and stylish SUV that features luxurious interior details like genuine leather upholstery, a Formula One-inspired flat-bottom steering wheel and a 7-inch thin-film transistor display. Additionally, features like a rearview camera, rear parking sensors, a power liftgate, remote starting functions and keyless ignition/entry functions are included as standard. 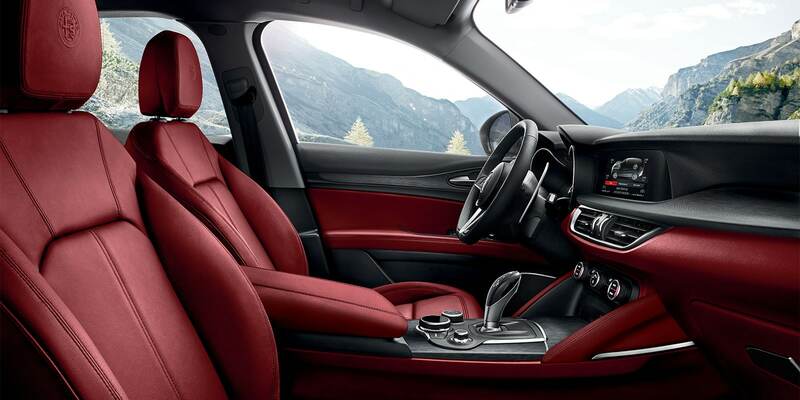 An optional Sport package adds a sport-tuned suspension, roof rails, aluminum pedals, column-mounted paddle shifters and 19-inch wheels, which replace the "base" Stelvio's 18-inch aluminum wheels. The 2018 Alfa Romeo Stelvio Ti, which stands for Turismo Internazionale, retains the Sport package's 19-inch wheels, and adds a larger 8.8-inch widescreen infotainment display, front parking sensors, a heated steering wheel, heated front seating, genuine wood interior accents and Sirius XM. There are two optional sub-trims available for the 2018 Alfa Romeo Stelvio Ti, the Ti Sport and the Ti Lusso, which add unique features to this already well-appointed vehicle. The Ti Sport trim adds a sport-tuned suspension, a sport steering wheel, black roof rails, aluminum sport pedals, an aluminum footrest, steering column-mounted aluminum paddle shifters, gloss-black window trim, high-performance leather sport seats, colored brake calipers and 20-inch wheels. The Ti Lusso trim features truly luxurious interior accents, like genuine wood trim in two exclusive styles, dark gray oak or light walnut. Additionally, the Ti Lusso trim adds Pieno Fiore Italian leather seating, 12-way power adjustable front seating, a leather-wrapped dash, a luxury steering wheel and aluminum performance features, like pedals and a footrest. There are other available features for the 2018 Alfa Romeo Stelvio, like adaptive cruise controls, blind-spot monitoring systems, rear cross-traffic alerts, lane departure warning systems, forward collision warnings, forward collision mitigation systems and smartphone integration services like Apple CarPlay and Android Auto. The exceptionally well-appointed 2018 Alfa Romeo Stelvio is a dream to drive, with the elegant lines and impeccable style, courtesy of the Italian craftsmanship you demand from a brand like Alfa Romeo. When will the 2018 Alfa Romeo Stelvio be released? The 2018 Alfa Romeo Stelvio is set to be released in the summer of 2017! How many trims are offered on the 2018 Alfa Romeo Stelvio? The 2018 Alfa Romeo Stelvio is offered in three unique trims and three sub trims; the Stelvio, the Stelvio Sport, the Stelvio Ti, the Stelvio Ti Sport, the Stelvio Ti Lusso and the Stelvio Quadrifoglio. Where can I learn more about the 2018 Alfa Romeo Stelvio Quadrifoglio? We have an in-depth review of the 2018 Alfa Romeo Stelvio Quadrifoglio, the top trim level of the 2018 Alfa Romeo Stelvio! Click HERE To Learn More About the 2018 Alfa Romeo Stelvio Quadrifoglio! 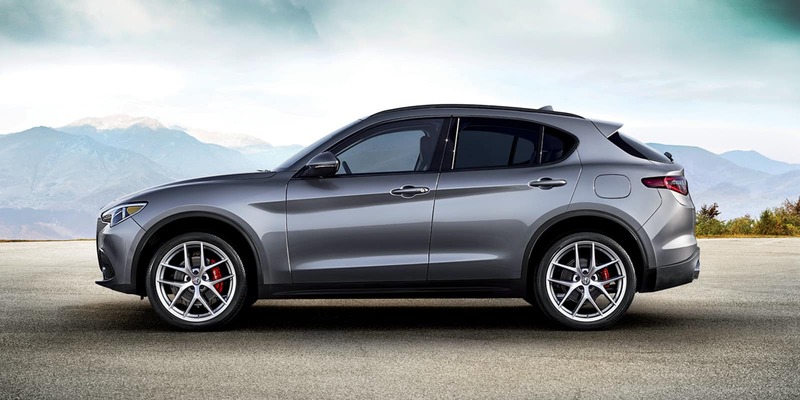 The 2018 Alfa Romeo Stelvio features an intelligent Q4 all-wheel-driving system that was designed to help you maintain absolute control of this performance SUV. Featuring a nearly perfect 50/50 weight distribution and segment-leading torsional rigidity, the 2018 Alfa Romeo Stelvio allows you to claim the road with the most direct steering ratio offered in the segment. The all-season traction control provided by the Q4 driving system is enhanced due to the 2018 Alfa Romeo Stelvio's ability to transfer over 50% of the torque created by the engine to the front axle, giving you more control in inclement weather. When the road is calling and you want to meet it in style, the powerful, luxurious 2018 Alfa Romeo Stelvio is the only answer. Stop by Alfa Romeo of Larchmont to test drive the exceptional 2018 Alfa Romeo Stelvio today!